I love a weekend roast, but I know a lot of people are a little intimidated by them - leaving them to the Mums and Grandmothers of their world because they do them best. What a lot of people don't realise is if you follow a few simple rules, roasts can be pretty easy! Once you know these roasting rules you'll find yourself experimenting with all sorts of combinations, like my roast chicken with apple stuffing. These are general cooking rules my Mum taught me which is always good to remember how long to cook your roast for. This way you don't need an exact size or have to use a recipe. Red meat: Cook the roast an hour for every kilo (kg) at 180 C. Then rest for at least 20 before carving. This will give you a roast on the well done side, which is most people's preference. If you like it a little on the medium side, poke your roast with a skewer in the last 30 mins and check the colour of the liquid that comes out. You'll be looking for a almost clear liquid, with a little pink. If well done, you want the liquid to be clear. White meat: Unlike red, white meats must be completely cooked through. As a general rule of thumb, cook your roast on 180 C for 40 mins for every kilo. Make sure you use a skewer before you remove it to check the juices running out are clear. If pink in any way, roast in 15min intervals until clear. Rolled roasts: This is not something I was told, but something I have learnt from experience. If a rolled roast with a stuffing, I usually find that the usual rules above work fine. If your cooking a rolled roast that is just all meat, you need to allow more time for it to cook. For white meat I allow an extra 20 mins per kilo on top of the ratios I've mentioned above. And for red meats, about 30 mins per kilo (if you are looking for well done). If you like it more on the medium side, no extra time required. Using the skewer to check before removing is a must, as depending on the size of the roast and thickness of the roll time may vary. 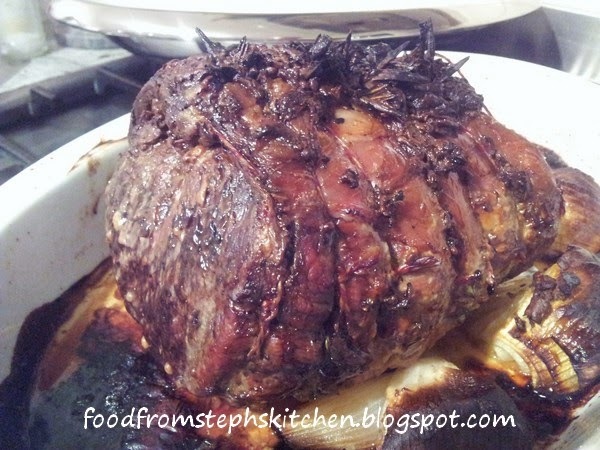 The roast I have for you is roast beef with a mustard and herb marinade. What I love most is you don't have to marinade ahead of time, and you can even just coat and roast straight away. It uses both Dijon mustard as well as seeded, with a combination of herbs and a little vinegar to give you a great flavour. If you are thinking it might be a strong flavour, I can reassure you it is mild. I also love to roast mine on top of quartered onions for extra flavour. It also allows the roast to sit out of any fatty juices from the roast that usual pool around it in the pan. 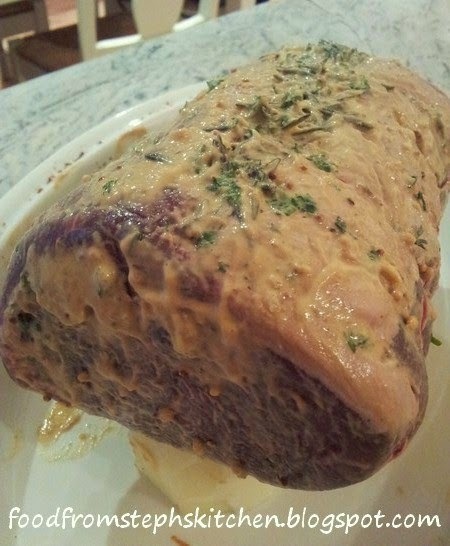 1.5 kg sirlion rolled roast - have also used topside before and it it just as nice. You could really use whatever cut you would like. In a small bowl add all your marinade ingredients, mixing until well combined. You could just smear this onto your roast but I've found a great (less messy) way of doing it using a large freezer bag. Yes, you heard me correctly! Grab a large freezer bag, add your roast into the bag and pour in your marinade. Remove the air from inside the bag and tie it off in a little knot at least 2 - 3 cm from the roast. To completely coat the roast simply move the roast in the bag, rotating until you are satisfied. Now, you can leave the marinade on as little or as long as you like. You can do this the day before or in the morning and just pop it in the fridge until you need it. If you are a little impatient and don't have time, you can remove the roast straight away. I usually make it up at least an hour before so I know it's all done. Pre-heat your oven to 180 C or 350 F.
In a large oven dish, preferably with high sides, place down your onions in the bottom of the pan in a sort of square. You want space between them but not too much. The placement will really depend on the shape of your roast. Once you find a position that you think will work, grab your roast (still in its bag) and place it on top. If you think it is in a good position to hold the roast up, then awesome. If need be play with it a little bit longer until you are happy. It's easier to do this now instead of when you have your roast out and it's all coated and hard to play with without making mess. Take the roast of the bag and place upon of the onion in the pan. I usually try to have a clean roast with as little oil/fat as possible as we find our tummies are thankful afterwards. As there is oil in the marinade, you don't have to add more oil if you don't want to. You can drizzle a little bit of oil over the top before placing it in the oven if you wish. Using the cooking rule of thumb above, I cook mine for 2 hours 15 mins (1.5 hours for red meat + 45 as it's a rolled roast) as Mr Steph only likes well done roasts. If I had my way I'd just do the 1.5 hours and have it medium. But you have to keep the "diners" happy, I guess!